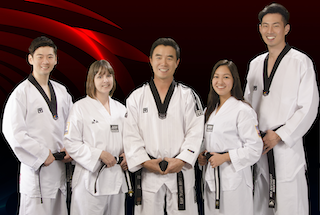 Like many of the adult students at our do-jang, I started taking classes after my children had become engaged in the sport. Both my boys, then 3 and 6, happened upon a Tae Kwon Do demonstration at a community event. They broke the demo boards, and the pride they felt was palpable. My older son has epilepsy, and while it is now controlled, his seizures had been so severe that for a time we did not know if he would survive, or if so if he would have anything resembling a normal life. 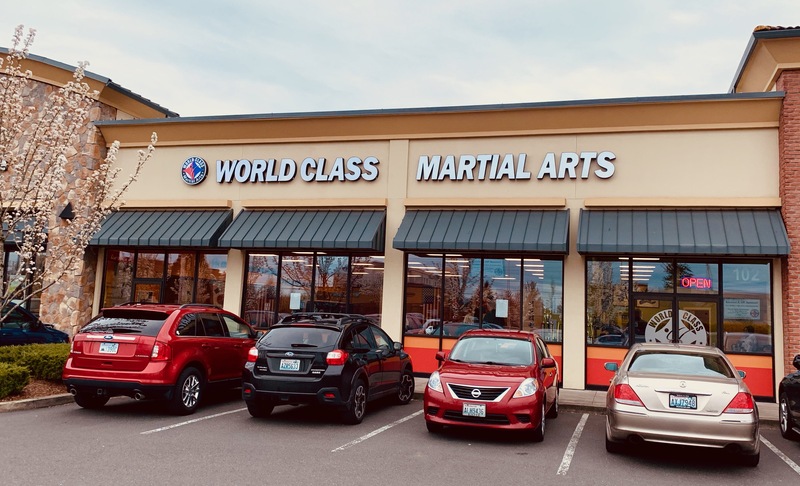 He has learning disabilities and physical challenges, so I thought martial arts training would be great for helping his balance and focus. I also knew he would benefit from extra help at home, so I signed up too. I was hooked from the beginning. Early on, one evening, I wrote a single item on a grocery list: coffee filters. When I woke the next morning, I saw in my drowsy state the night before, I had written “Kukkiwon.” There it was, on my refrigerator. I can explain—the pencil had been sitting next to the black belt key chain from the world tae kwon do headquarters—but still. It was a startling message. The weaknesses and fears I face are not in short supply. I still fear looking ridiculous. For months, however, if I wanted to do a roundhouse kick with my left leg it had to be in the swimming pool, so I had to get over wondering how I looked to non-martial artists pretty quickly. I deal with jealousy. I watch other children complete the forms so easily while my son struggles to learn. I deal with the fear of re-injury every time I step on the mats, and this will not resolve any time soon. I have become more motivated to work on balance and strength training though, and am in better shape than I have been in years. I face these fears class after class. This would have been a different essay a few months ago. Flush with enthusiasm for my new sport, I would have written about my inevitable black belt, and all the benefits my new found passion and fitness are bringing. I am almost 40, and now that I am solidly an intermediate student and no longer a beginner, I see how far I have to go. My initial enthusiasm is tempered by the realization of just how much physically I still have to overcome. But there is something more meaningful than the pretty powerful bragging rights of being a black belt some day. In the struggle, in facing the fear, I feel as powerful as a warrior. I struggle to reconcile with the more violent aspects of the sport. A fellow physician, an advanced martial artist, told me about his making peace with this dichotomy. He states in facing an opponent, he has a choice. “I could kill you, but instead I choose to lay you down gently.” He could grade his response to the minimum needed to assure his safety while doing the least harm. I hope that by learning how to fight, I will never need to. For my sons, I hope they learn something of the spirit of the Hwarang. I think of my nephews in Tibet, working hard to bring in the harvest, or taking the yaks up into mountains and warding off predators. Unlike their cousins, my boys are not called upon to do anything physically demanding in order to support the family. I want them to have an arena to learn to push themselves, to test their strength, and to learn to fail with grace and get up again. In our community, there are many refugees who have walked for days through the Himalaya, hungry, desperate, afraid for their lives. I am grateful my boys have never been tested like this and I hope they never will be. Lacking a vision quest or a rite of passage, though, my hope is that in their Tae Kwon Do practice they have to dig really deep some day, to find some extra stamina and courage they didn’t know they possessed. Next week, my older son and I will enter our first tournament. We will not spar yet—that will come in time, as he advances his skills and as my reconstructed knee heals. We will both compete in Poomsae. I keep thinking, am I really doing this? Competing in Tae Kwon Do? It doesn’t make sense, on the surface. However, the benefits for myself and my family have been numerous. I feel stronger than I have in years. My children are more conscientious and confident. I keep journals and have for decades. I reread some writing from when I was 19. I was uncertain, so afraid of failure. Yet I was an outstanding student, an Academic All American in Crew and a marathon medalist. I realize, now, I am not becoming a warrior—I always was. Joining Tae Kwon Do is not about becoming something new—it’s about discovering what has been there, unrecognized, all along. Now, my body is less agile, I’ve had my share of torn ligaments and broken bones. Yet here, in this broken and mended body, now, my mind is whole, my spirit unyielding.